This Giant Inflatable Ball is 51 inches of pure fun to be enjoyed by the entire family! After the ball is inflated, place it in a wide open space. Then climb inside of this huge inflatable ball and you can do all sorts of neat thing: crawl, tumble, roll, jump, and more! The possibilities are endless with the giant inflatable ball for kids that has ten windows that are transparent and both an entry and exist. 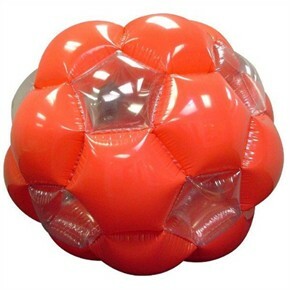 This big inflatable ball that you can ride inside holds up to 150 pounds. For ages 4+. Availability: This Giant Inflatable Ball ships within approximately 5 business days. Please note this item ships GROUND ONLY. It does not ship Express or to PO Boxes, or APO Addresses.